Rainbow and Sunshine children LOVE i-boards! The GREAT news is that they are now Free! TLS Education Limited aquired i-board and is set to continue to expand Reception and Key Stage One resources - there are so many new i-boards to explore since Rainbow and Sunshine purchased the Purple i-board CD-ROM a few years ago. "i-board activities are open-ended, visual resources for learning dialogues." The site has a user friendly "Library" listing learning areas and each year group retains its original colour: Reception/purple, Year 1/red, and Year 2/green. There is also an Early Years section in blue with 21 i-board activities. Plans to develop resources for Key Stage Two are in the pipeline. 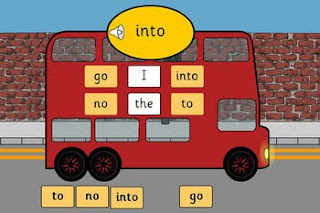 Today in Rainbow Class we played three of the Tricky Word Games (phases 2,3 & 4) on the Interactive White Board - the children loved the format of the words on vehicles as well as the challenge of hearing a word, reading it and matching it (there is also a simple mode of word matching). A number of children enjoyed exploring the site independently or with a friend on PC's. Wow! I'd never come across this before, thanks so much for sharing this fantastic site! !